The ideal components for a perfect coffee break can be found at Hamnbageriet in Nynäshamn. Explore our variety of fresh pastry and organic coffee. Enjoy at a fantastic location in the Swedish archipelago. Welcome to Hamnbageriet (The Harbour Bakery) in Nynäshamn. Our café/bakery was established year 1986. Since then we have always strived to offer fresh bread, pastries and coffee of high quality. 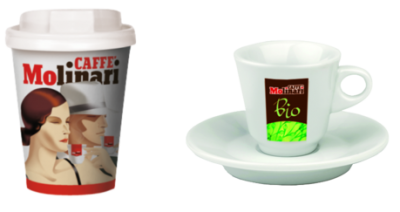 Our wide selection of Italian coffee is entirely Organic and Fairtrade by the brand Molinari. We also offer premium teas, hot chocolate, chai latte, refreshing smoothies and cold drinks. If you are hungry you will find healthy light meals such as salads, sandwiches and wraps. Grilled foccacias and paninis are also offered. Everything can be enjoyed on the spot or as take-away. There are more products to find in our shop. Quality is important for us at Hamnbageriet, Nynäshamn. Our coffee is from the Italian premium coffee-brand Molinari. The offered variety of coffee is entirely Organic and Fairtrade. For instance our baristas serve Cappuccino, Café au lait, Americano, Espresso, Macchiato and Moccachino. Enjoy on the spot or take-away. Read more about Molinari here. Hamnbageriet in Nynäshamn offers something for everyone. Click here to explore our products. Hamnbageriet is closely located to: Train and Bus station of Nynäshamn, Parking, Terminal for Gotland ferry boats, The harbour, Tourist information office and Nynäshamn Center.